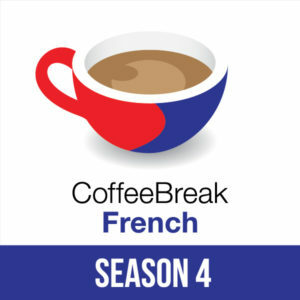 We’re delighted to announce that Coffee Break French is returning for a fourth season for intermediate to advanced learners! From 21st October we’ll be publishing the forty episodes of Coffee Break French Season 4 over the next year. In a similar vein to season 3, we’ll be following a story each week: you’ll meet Sylvie who has recently moved to Paris for work, and you’ll share her experiences as she creates a new life for herself in the capital through her regular emails to her mother. Like any maman, Sylvie’s mother worries about her and hopes to visit her soon, although she probably spends more time worrying about Sylvie’s love life! And then there’s Matthieu, who is also working in Paris and who, through time, will get to know Sylvie. But how will Matthieu’s “friend” Gabrielle feel about this? You’ll need to stay tuned to find out! As with all our courses, Coffee Break French Season 4 is full of interesting constructions, tricky grammar points and wonderful French idioms, and we’ll be presenting everything in our usual style with lots of help and assistance to help you make progress. For this series, Mark will be joined by Pierre-Benoît and together they’ll present each episode in a combination of French and English. We’ll be releasing some preview content along with details of the members’ version of the course over the next few weeks, so stay tuned! What great news! I can’t wait until the 21st of October – very excited about Coffee Break French, Season 4!! I am sure it will be just as exceptional as the previous lessons. Thanks for continuing the learning experience with Coffee Break French. Delighted to hear about Season 4. Can’t wait until 21st October. Oh my…that is so sweet. Love to listen to Mark and his teaching. That’s fantastic news about CBF Season 4! I’m really looking forward to it. Thank you to Mark and the Radio Lingua Team for providing such great learning material. J’ai longtemps attendais à cette bonnes nouvelles. so excited about Coffee Break French Season 4, as well as all the other wonderful announcements that you made yesterday! Thank you Mark and thanks to the whole team too. Merci. Je l’attendrai avec plaisir. J’étais désolée quand je suis arrivée à la fin de la troisième année. Mais ça va être difficile d’attendre la prochaine leçon de semaine en semaine. Je me suis accoutumée à écouter Coffee Break French chaque jour si je le voulais, puis que je n’ai pas commencé à l’écouter qu’à l’année passée. Excellent news! I have made so much progress with CBF, started from the beginning and just finishing season 3. Cool. Absolutely fantastic news. Coffee Break French is really, really helpful and great for my confidence in moving forward learning and speaking French. Je suis ravie d’entendre que je peux plus apprendre le français avec Mark et Pierre-Benoît! J’ai hâte de commencer la nouvelle saison! I am so happy that you will soon be airing season 4 of CBF! The previous seasons have helped me immensely in learning the language. Each year, I travel with my daughter to Paris on business and I have plenty of opportunities to practice speaking while I am there. Last year, I spent about a half hour conversing with two older sidewalk artists who were working near the Trocadéro. I had a very nice conversation with them. I am from the States and they asked me if I was Swiss! I felt that all my practice had paid off and I was getting close to sounding French. Such great news! I am almost finished with the third season and am so pleased that I will be able to follow and learn all that’s to come in season 4 as it keeps coming out. Formidable! ça! Il faut que je fasse d’espace maintenant dans mon iphone. I can’t seem to find the place where I can buy season 4. I’m going to ask Santa for it 🙂 I’ve checked i-tunes and the radio lingua site. If you click on the Coffee Break French Season 4 ad in the sidebar you’ll reach our purchase page. Here’s the link: /amember4/signup.php?price_group=17 – hope that helps.